The ability of a beam to carry its loads (tension and compression, shear and flexure) depends entirely on two things: the shape of the beam, and the material it’s made out of. I already covered shape of beam in a previous entry. That means today’s topic is strength of materials. We all know that steel is stronger than wood, and wood is stronger than silly putty. But how much stronger? Every material in the universe can be defined quantitatively by its material properties, which describe how the material will respond to various forces. I want to discuss one of the most useful material properties: the elastic modulus. Let’s look at that phrase, “elastic modulus.” Modulus means a mathematical constant, in this case how readily the material stretches and deforms under load. Elastic means the material returns to its original shape when the load is removed, just like a rubber band. A material with a high elastic modulus requires a large load to stretch even a little bit. For example, steel, one of the stiffest materials, has an elastic modulus of about 29,000,000 pounds per square inch. That means if you have a 1-square-inch bar of steel, you need to pull on it with 29 million pounds of force for it to double in length. (In fact, the bar would break long before it stretched this far.) A school bus weighs about 30,000 pounds. If you hung one from a 1-square-inch bar of steel, the bar would stretch only a tenth of one percent. 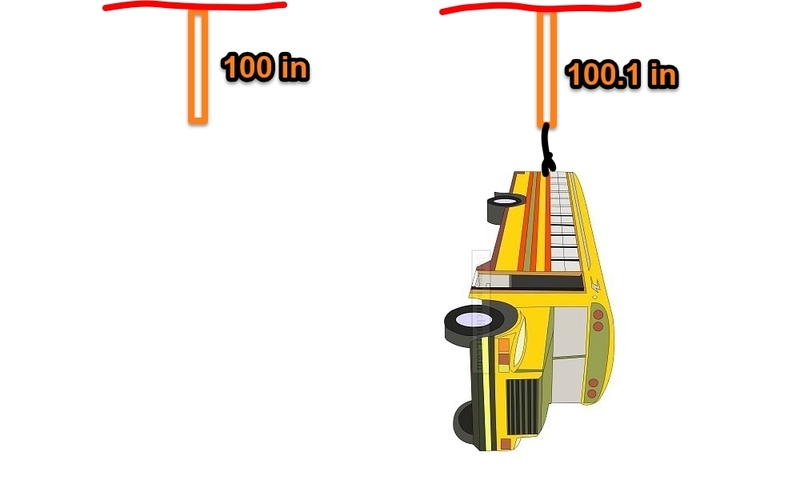 A 30,000-pound school bus stretches a 1-inch-square steel bar by only 0.1%. For the sticklers out there, I’m talking about a specific kind of elastic modulus called the Young’s modulus, which applies mainly to tension and compression rather than bending. It makes the discussion simpler.